For varieties that can over-winter with the minimum of protection sow in late summer (Aug/Sept) or for summer varieties sow early Spring to allow plenty of time for the seed to ripen in the same year. Select two or three of the best lettuces from your row, and mark them for seed – stick a label next to them or tie some string round the bases. 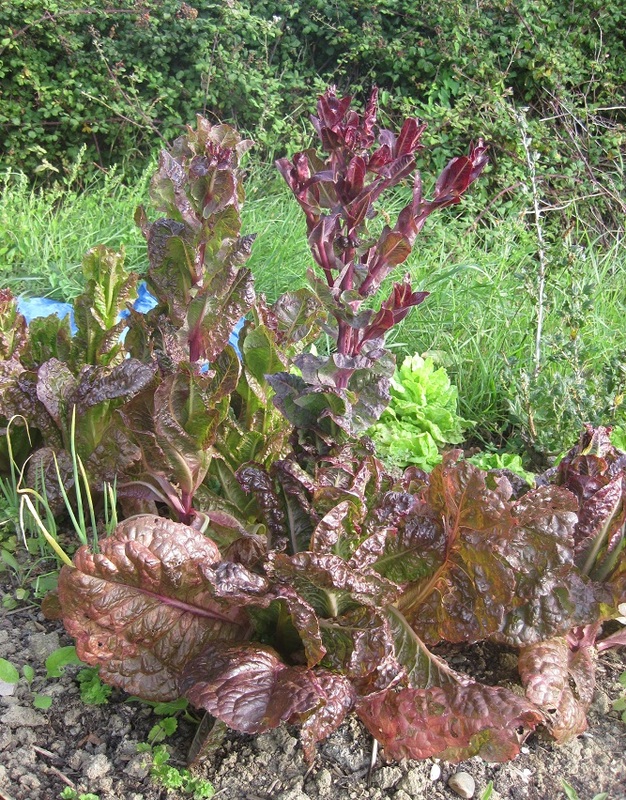 It is important not to save seed from any plants that bolt early, as you want to select for lettuces that not only stand well but have the best growing qualities/attributes. 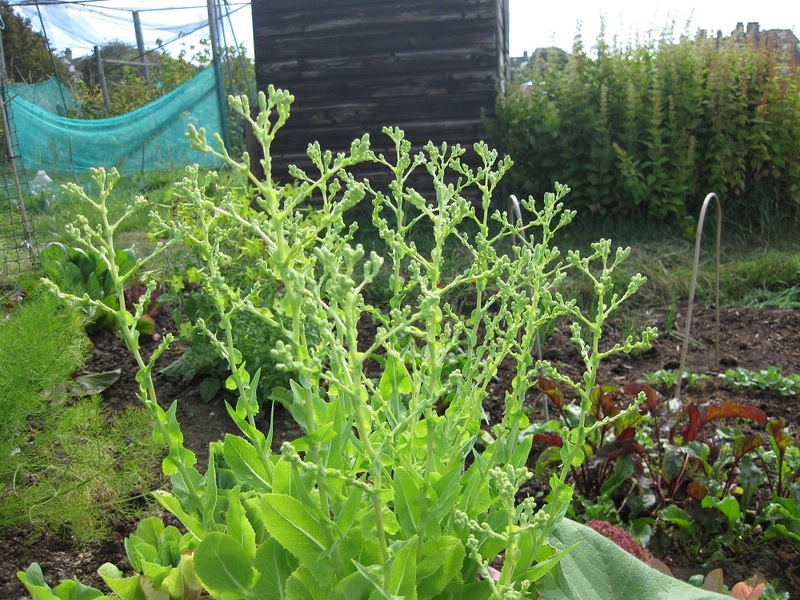 The lettuce will grow a long upright stalk, which has the flower heads (seeds) on it. The flowers are yellow. Once the lettuces have flowered, the seeds will ripen gradually. Advice is to harvest seed daily to get the maximum yield, shaking into a bag, or to wait until a reasonable number of seeds are ready and then cut the whole plant down. 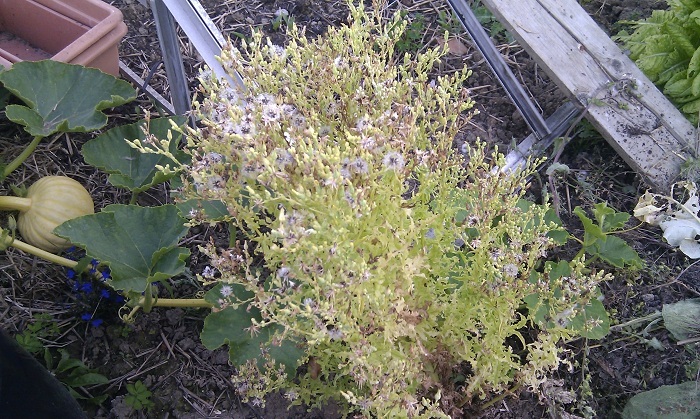 The seed flowers / heads are yellow and will start to dry on the plant to a dull light brown colour. When you touch them they rustle a little in your hand. ripen over the next few days. Most of what you collect in the bucket will be ‘feathers’ and chaff, these are white in appearance To sort the seed, shake it gently in a kitchen sieve. Some seeds will fall through the sieve, with the rest collecting in the bottom. The feathers and chaff will rise to the top, and you can pick them off. 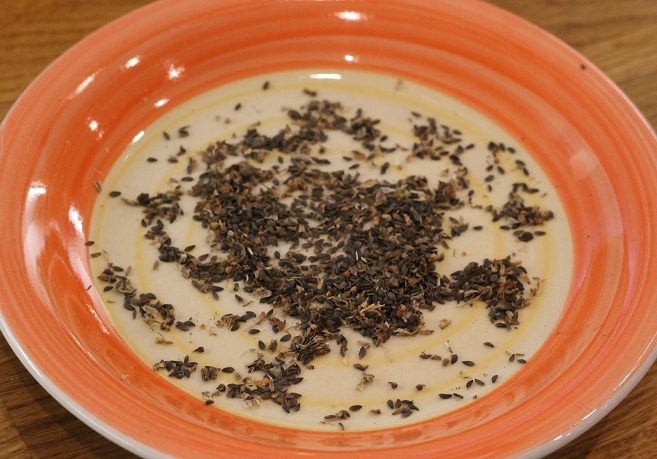 I found it best to empty small amounts into a bowl and then rub the seeds / chaff between my fingers and the seed pods opened up fairly easily that way. If the seed feels a little damp, dry it further on a plate before labelling and storing. Lettuce seed should keep for around 3 years, provided it is kept cool and dry. Thank you, and thanks for popping in. I’m still on a major learning curve when it comes to seed saving! I allowed three lettuce plants to go to seed. I was nervous about collecting the seeds and not sure how to…your post will help me out! Thank you! Sorry for the delay in responding!! Hope the seed saving went well – it can be a bit hit and miss when waiting for the seeds to dry on the plant – leave them too long and the pop and distribute themselves freely in the surrounding soil, too early and green and you end up waiting forever ! I find a sunny window sill inside is really useful for drying them off . I just harvested the last of my cilantro seeds! I labeled and dated them and am thinking I may plant them in the window sill. I so love cilantro! NO worries on the delay. I’ve been a bit MIA myself. Thank you for chatting. Have an awesome week!